so excited to be here with all of you. 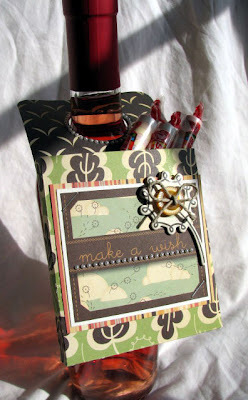 Today I will be sharing a tutorial on how to make a hanging treat box. This is a Super fun and easy project. You can use it in a variety of ways. So let's get started. First a list of supplies you will need. Circle punch/maker the size of the hole your box will hang onto. embellishments (patterned papers, stickers, stamps, ribbon etc.) Your choice. Take your 5 1/2" X 11" piece of cardstock and score at 4" and 4 1/2" on the 11" side. 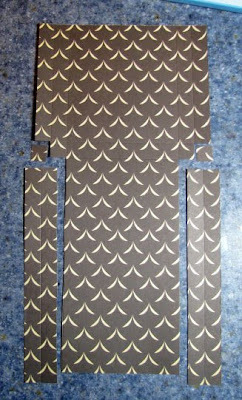 Now score your cardstock on the 5 1/2" side at 1/2", 1", 4 1/2" and 5"
Now you need to cut away the sections of cardstock shown below. Cut a slit on both sides to create tabs to be folded in. fold on all score lines. Round the corners on the long back panel and cut your hole. 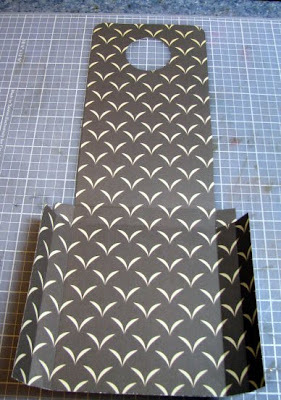 Decorate the front area as desired then assemble your box using a strong adhesive. If you find it easier to assemble your box first you can do this also. Again this is totally up to you. Now you can hang your treat box onto whatever you like. Then fill with some small treats. I hung mine on a bottle of wine for a fun New Years gift for the hostess. I hope you have enjoyed this tutorial and will give it a try. 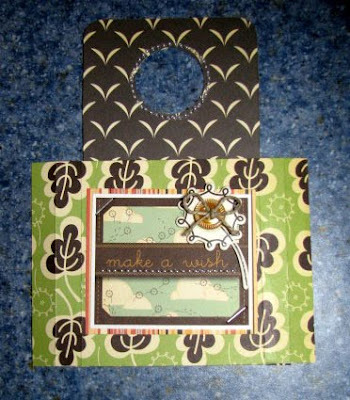 For my project I used the Cosmo Cricket EARTH LOVE papers and embellishments. You can find them in the store here. Thanks for stopping by today. Wishing you and your family a great New year ahead! Jenn I am tickled pink to see you Guest Designing here at Die Cuts! You are just so creative, I've always LOVED your craftiness! And what a fun treat box! I love the Earth Love paper! SUPER DUPER CUTE JENN!!!!! We are so happy to have you as a Guest Designer!!! What a timely craft project! I'm going to have to try this one out. Thank you so much for sharing this fun idea with us, Jenn. That is a great tutorial...I would like to try it. I do have a question.....It goes from Step 4 to Step 6.....is there a Step 5? thanks very much for the tutorial. love this! Will have to work on it today as i have the day off!! Yeah! This is a great idea! So cute! Thank you so much for being a guest designer. What a great tutorial. I've even passed it on to my sister; she is going to a New Year's Eve party, and has been wondering what to give to the hostess. Your timing is perfect! What a cute treat box! I will have to make some of these for sure! Thanks for sharing! This is darling, thank you for sharing! Your papers and design are great! Thanks for coming by and checking it out. I hope you like it! Have a great day, I enjoyed playing along!!! I am going to get a lot of use out of this pattern. I am off to check everyone else’s creations now! MWAH! Jenn, this is so clever! Love the paper. Thanks for joining DCRU!! Jenn, this is awesome! Will definitely have to give this a try. TFS!!! Waoo... This is a gorgeous project. Love it!!! Hey Girlfriend!! Love love love your tutorial!!! Your creations are always sensational...just like you!!!! So happy to see you at DCRU...you are a perfect fit!! !